Easter Eggs are small fun stuffs hidden inside the software, you have to find to get it, or google it. 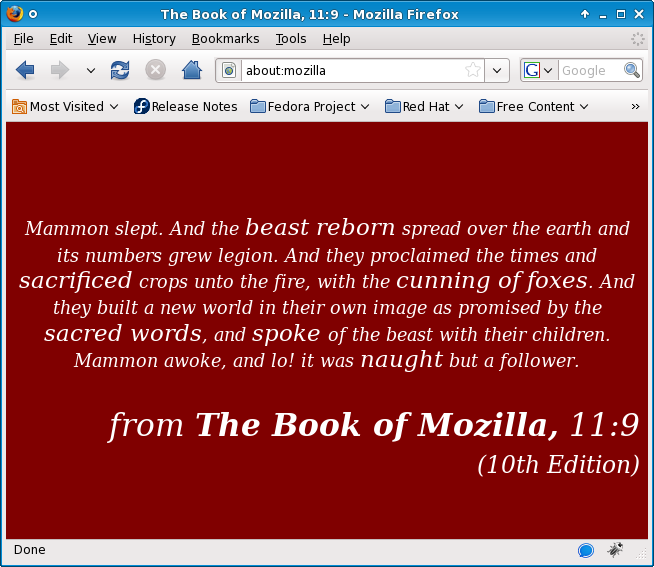 Here is two Easter Eggs from firefox3 . Check them out, they are fun. Just type in about:robots in the address bar and get a very funny message and a robot pic. It says “Gort! Klaatu barada nikto!” . What is this! This is a phrase originating from the science fiction film The Day the Earth Stood Still . Check the wiki link http://en.wikipedia.org/wiki/Klaatu_barada_nikto . The page is displayed in the format of Address Not Found page, and has a Try Again button. When you click the Try Again button, the button says : Please so not press this button again. . If you click it again it simply vanishes. This is great. I love Easter Eggs. ~I wonder what the robots plan is=)….